Are Twitter Lead Generation Cards the Email Marketers' New Best Friend? At one time, Twitter cards also included Instagram photos, but after Facebook scooped up Instagram, Twitter eliminated Instagrams showing up in cards automatically, and you now have to click through to view photos posted on that platform. The whole “cards” thing has been much ado about nothing, historically. The recently launched Lead Generation Cards, however, may change how you think about cards, and might even revolutionize the role of Twitter in your paid social advertising mix. These cards enable advertisers to upload an image of an offer, and if you are interested in that option, you click just one button and voila! you have signed up. Twitter utilizes the email address you use in your member profile, and delivers that to the advertiser. 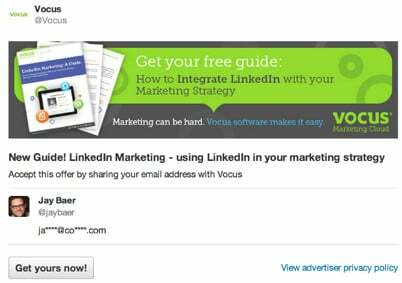 Think of it as the world’s easiest, one click email sign-up form, as you see here from Vocus. Lead Generation Cards reduce participatory friction to almost nothing – it’s the perfect balm for lazy but interested consumers, especially those on a mobile device who don’t want to fill out forms. This is an exceptionally easy program to launch, is reasonably priced, and could be a terrific direct response vehicle for businesses of all sizes. Here’s an excellent post from Hubspot on the step-by-step. I’ll be recommending that our clients interested in email subscription growth try this ASAP, and I’m considering using it to distribute free excerpts of my new book, Youtility, once they open these cards up to individuals/small business. What do you think of Lead Generation Cards? Worth a shot? Personally, I’m more excited about this than just about anything Twitter has offered on the advertising side.